Sydney and Chapin are our two Greater Sulfur Crested cockatoos that we brought back from Australia in 1999. We're going to list some of their favorites and we welcome your your cockatoo's favorites to add to the list! 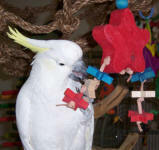 If you're cockatoo is a "mega beak" chewer, then please (click here to see XL toys)! remember that acrylics are breakable so if they're particularly destructive, stay away from acrylics! Click on the photos for detailed descriptions, larger pictures, more size options and ordering information! MYOT (make your own toys) Parts ... click here for more choices! 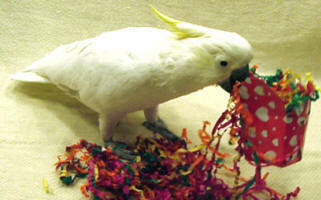 Our Cockatoos love foot toys ... for more choices ... click here! More "LARGE" toys ... click here! Want educational and interactive toys? Press here!